From their early days on Hemispheres, A Farewell to Kings and 2112, to the more recent Clockwork Angels; Rush has lovingly weaved the themes of liberty, understanding and wonder into their tapestry of sound. I highly suggest checking out any of the albums listed above as they’ve all enriched my life. For me, it was an affirmation that it’s all right to totally believe in something and live for it and not compromise. It was a simple as that. 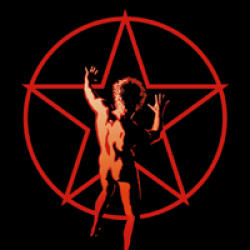 On that 2112 album, again, I was in my early twenties. I was a kid. Now I call myself a bleeding heart libertarian. Because I do believe in the principles of Libertarianism as an ideal – because I’m an idealist. Paul Theroux’s definition of a cynic is a disappointed idealist. So as you go through past your twenties, your idealism is going to be disappointed many many times. And so, I’ve brought my view and also – I’ve just realized this – Libertarianism as I understood it was very good and pure and we’re all going to be successful and generous to the less fortunate and it was, to me, not dark or cynical. But then I soon saw, of course, the way that it gets twisted by the flaws of humanity. And that’s when I evolve now into . . . a bleeding heart Libertarian. That’ll do. Yeah, that was a sad interview indeed – though it confirms the past albums were indeed fueled by the ideas of liberty. However, I would make the case the new stuff is just as inundated with his libertarian ideals. If you read the companion book to the Clockwork Angels album I would say his views dovetail with some of those of the thick libertarians. In the book by Peart and a Kevin J. Anderson they set up the world with two opposing forces the ‘watchmaker’ and the ‘anarchist’ but in the end they turn out to be the same violent forces on a spectrum. By contrast, Peart I think makes his distinction between these forces by having the main character reject both parties and settle on calling himself a ‘dreamer’; a non-violent person that just wants to discover and live in peace – outside the system of violence. I think this is really Peart winking at us saying he hasn’t really changed all that much but would rather just be outside this whole political discussion. To my point: Recently Matt Kibbe released a hearbreaking excerpt of his book that deals with the media’s constant attacks on Rush through the years; specifically with Neil Peart, I think between the media and his family tragedies, they really did beat him into the ground.